Dr. Bluiett is an associate professor of curriculum and instruction at Samford where she teaches reading and language arts methods courses. Dr. Bluiett, also a P-12 reading specialist, is the director of the M.S.E. in Elementary Education online program and serves on various university committees. Her research interests include early literacy and oral language development in preschool children. Prior to coming to Samford in fall 2012, Dr. Bluiett was an instructor and professor in the School of Education at the University of Montevallo. Dr. Bluiett began her career in the Shelby County School System where she taught first grade at Valley Elementary School from 1992-2001. 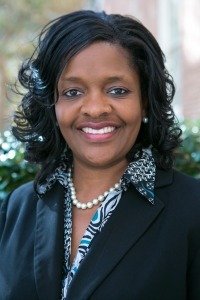 Dr. Bluiett is an active member in her church and is involved in various outreach ministries. She enjoys collecting and restoring antiques, reading, exploring interior designs and spending quality time with her daughter, Nylah. Hoaglund, A., Birkenfeld, K., & Bluiett, T. (2014). “Data Meeting Model: Developing Data Focused Pre-Service Teachers. Reading Improvement, Volume 51, Number 3/Fall 2014. Bluiett, T. (2014) The V.A.L.U.E of Online Learning. AASCD e-newsletter, published quarterly. August, 2014. Bluiett, T. (2009). The Language of Play and the Power to Limit Gender-Role Stereotypes. Background Research Paper: The Office of Research on Teaching in the Disciplines, The University of Alabama. Tuscaloosa, Alabama. Bluiett, T. (2014). Writing Workshop: Getting Started. Professional development workshop presented at Martin Luther King Jr. Elementary School, Tuscaloosa, Alabama. Bluiett, T. and Harris, K. (2014) Writing, Rubrics, and Assessment, Part I. Professional development workshop presented at Martin Luther King Jr. Elementary School, Tuscaloosa, Alabama. Bluiett, T. (2014). Rigor, Relevance, and Relationships. Lowndes County Public Schools Mega Professional Development Day, Letohatchee, Alabama. Bluiett, T. (2014). High Interest Literacy Strategies for Struggling Readers. 2014 School Improvement Summit, Lowndes County and Montgomery Public Schools, Montgomery, Alabama. Bluiett, T. (2014). Differentiated Instruction for the Common Core (K-5): Alabama College and Career Ready Standards. Lowndes County District Professional Development, Hayneville, Alabama.